To Smooth Ambler, for the second time this advent. Having been slightly underwhelmed by their Contradition last week, I’m curious to see how their Old Scout measures up. As a young distillery, their older offerings such as this are bought in from other producers – some searching suggests that at least some of that older production comes from MGP of Indiana, who also appear to supply a number of other familiar names. Presumably the long term plan at Smooth Ambler is to move over to their own supplies, once they’ve had enough time to mature – time will tell as to how this will affect future flavours! 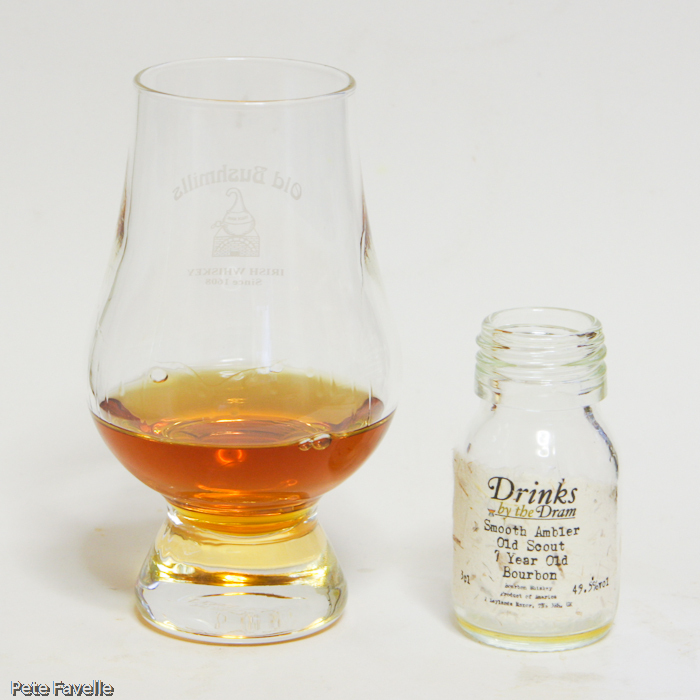 Smooth Ambler Old Scout 7 Year Old Bourbon turns out to be an old friend, as I reviewed it back in May this year. My previous review reveals that it more than makes up for the lacklustre Contradiction – not only is it a smooth and spicy bourbon with heavenly dried apple aromas and fruity flavours but it scored an impressive 4.5 stars, making it my highest rating bourbon so far! Many thanks to Master of Malt for providing their excellent Bourbon Advent Calendar this year.